Just because you turned 40 does not mean you are over the hill. Matter of fact you’re still climbing up that hill. 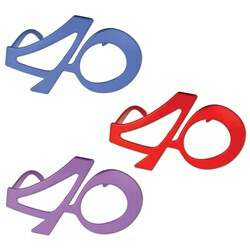 During the celebration of your 40th birthday accessorize your outfit by wearing these 40 Fanci-Frames (1/pkg). By wearing these 40 Fanci-Frames, you will show your party guests that you’re not afraid of a number and that you’re anticipating a spectacular year as a 40-year-old. This inexpensive party accessory is a plastic novelty eye-wear without lenses done in a metallic finish available in assorted colors of blue, purple and red. Specific colors cannot be requested. Brighten up your 40th birthday celebration with 40th Gleam N Burst Centerpiece, Happy 40th Birthday Beads of Expression (1/pkg) and Multi-Color Happy Birthday Fanci-Fetti.